I have officially moved into my new apartment and I am so excited to give you all a tour! 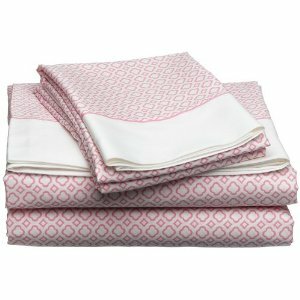 First up, my bedding: I chose Tommy Hilfiger Hibiscus Hill Pink (thanks Homegoods!). I bought a pillow awhile back and it matches this bedding! The comforter is reversible so I can switch it up! I also got a spare set of white sheets with pink ruffles thanks to the Lilly Pulitzer Rue La La sale! I had TH bedding when I was younger, and I loved it. The sheets were so soft. Enjoy! so cute! i love those sheets, and don't you just love Homegoods? Looovvveee. I hope you're enjoying the new apt! Can't wait to see more. Congrats on the apartment and I love that Tommy Hilfiger bedding! My Lilly loving friend/sorority sister/roommate just purchased the same bedding for her new place! Congrats! Hope you're enjoying your new place! I love your bedding, it's so cute! Ahh we have the same bedding! I just wrote my post about it for tomorrow. I cannot wait to actually use it in my apartment next year!!! Cute stuff!! Congrats on the new place! !